Turnover at sales hit by impact of international sanctions but it’s not all bad news, says Theodora Clarke, the event's director. Russian Art Week will once again take centre stage in the British capital in late May and early June in a demonstration of the unifying power of art. London continues to be a hub for Russian art and culture. The fair takes place 29 May – 5 June and will include major sales of Russian art at the leading auction houses accompanied by a varied program of Russian cultural events. Recent political tensions have affected sales and we saw the impact of economic sanctions at the last event in November 2014, when we witnessed a 37 percent decrease in sales compared with the same period in 2013 – the lowest result since summer 2012. However, despite a reduction in spending by collectors, there have been several highlights, including the sale of Valentin Serov’s 1910 Portrait of Maria Zetlin at Christie’s. The painting fetched £9.2 million, making it the most expensive painting ever sold in a Russian art sale and Christie’s the current leader amongst the auction houses with a 49.7 percent market-share. The international situation makes it difficult to forecast the results of upcoming sales, but it’s likely that major quality works by significant artists with good provenance will continue to do well. Russian Art Week is to provide a great opportunity to discover new names as well as to enjoy the classics. The major auction houses continue to offer remarkable Russian art works and this summer is no exception. Bonhams will present Voilier et coquillage, a late still-life by Alexandra Exter, a delicately painted landscape by Ivan Pokhitonov, and a early 20th century Moscow-made silver-gilt presentation kovsh - an oval shaped traditional Russian drinking vessel - decorated with shaded cloisonné enamel. Christie’s will offer several unique pieces of decorative art, including a lavishly decorated two-color gold-mounted guilloché enamel desk clock, a wonderful example of the two most popular techniques used by the Fabergé workshop. Painting highlights of the upcoming sale at Christie’s include Arsenal Hill at night (1907-1908), a rare work by Niko Pirosmani, the proclaimed Georgian Primitivist artist and a unique group of four works by Filipp Malyavin, including a large work in oil Baba on a swing. The provenance of Malyavin’s work can be traced to the daughter of the artist and serves as a magnificently vivid example of Malyavin's beloved peasant scenes, which showcases the beauty of the Russian countryside. 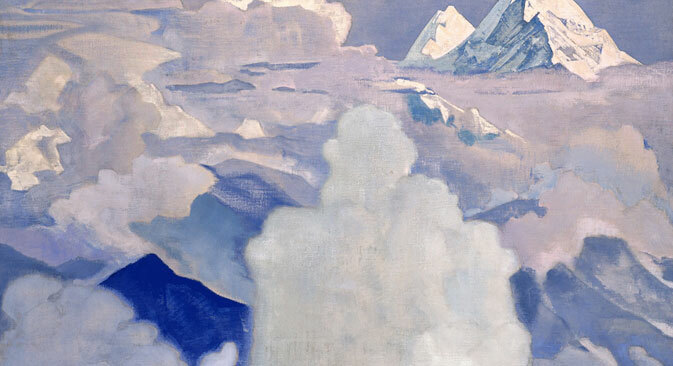 Two magnificent masterworks by Nicholas Roerich presented at the sale also deserve a special mention: White and heavenly from the series His Country and The Host of Gesar Khan, both reflect themes inspired by Roerich’s Central Asian expedition. Hosting three sales of Russian art in June, Sotheby’s will offer a diverse selection of Russian art from the 19th and 20th centuries, including an oriental landscape by Ivan Aivazovsky, Evening in Cairo, 1870, and a gouache by Pavel Tchelitchew, Bullfight, 1934. With a special focus on Russian decorative art, the dedicated sale’s highlights include an Imperial silver-gilt and cloisonné enamel triptych icon, 1886, by Khlebnikov, presented to Tsarevich Nicholas Alexandrovich, later Emperor Nicholas II, as well as an Imperial hardstone figure of a parrot by Denisov-Uralski, St Petersburg, made in 1913-1914 for Dowager Empress Maria Feodorovna. At auctioneers MacDougall’s two charming depictions of Russian nature by well-known masters will be presented – Autumn on the Krestovsky Island, 1892, by Ivan Shishkin and Spring in a Village, 1920, by Konstantin Korovin, in which both masters succeed in conveying the intimacy of nature in Russia. Among other impressive lots are works by two Russian émigré artists – Pavel Tchelitchew’s Portrait of My Father, 1939, and Nikolai Fechin’s Peasant Woman Sitting on a Trunk, circa 1910. Anyone interested in contemporary Russian art should head to Maxim Boxer’s sale at Erarta Galleries London, which is holding its third themed auction, this time co-curated with artist Leonid Tishkov. It will examine the tradition of “CartOOn-like art” in Russia, tracing the evolution of its visual language and distinctive humour from the lubok imagery of the 18th century to contemporary pictorial art, comics and animation. With some 50 artworks, the auction will bring together the variety of approaches to cartoon-like aesthetics, presenting a range of techniques, developed by contemporary Russian artists, including Pavel Pepperstein, Igor Makarevich, the “Blue Noses” group, Konstantin Zvezdochetov and the “Mitki”. In addition to the auctions, a program of Russian cultural events will take place across London. To celebrate Russian Art Week at Erarta Galleries Tishkov brings his Private Moon to London for the first time since 2013. Another London gallery Brun Fine Art will showcase a collection of Russian art by exhibiting, among other objects, a beautiful pair of 19th century armchairs in gilt bronze and faux malachite and a fine 19th century gilt bronze and malachite ink set. Other exhibitions include Tate Modern’s show dedicated to 20th century Russian émigré Sonia Delaunay, a leading abstract painter and Pushkin House’s photography exhibition of Pulitzer Prize-winning photographer James Hill, Russian Veterans, marking the 70th anniversary of the end of the Second World War. Studio Voltaire will present a show of works by Sanya Kantarovsky called Apricot Juice and inspired by Mikhail Bulgakov’s enigmatic novel The Master and Margarita. A range of concerts and performances will complement the visual arts programme of Russian Art Week. The renowned singer Hibla Gerzmava will present a selection of the best Italian and Russian opera at Opera Holland Park. On the South Bank pianist Alexei Volodin will be making an appearance at Queen Elizabeth Hall and English National Opera will present The Queen of Spades, a new production of Tchaikovsky’s dramatic opera about greed and obsession. Theodora Clarke is the editor of Russian Art and Culture and director of Russian Art Week in London. For more information on the full programme see www.russianartweek.co.uk and find out where to pick up a printed copy of the Russian Art Week guide.